An illustration of the initial explosion in the death of a massive star. Black hole creation is crazier than previously thought, new observations reveal. Over the course of just a few minutes, as a massive star dies and a black hole is born, multiple explosions cause the black hole to powerfully eject matter as well as greedily consume it. 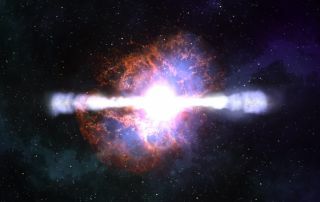 It all starts with a gamma-ray burst - the most powerful type of explosion in the universe and an indicator that a massive star is dying in what astronomers call a hypernova. A surprising chain reaction ensues as the black hole forms from the collapsed remains of the star. "Stars are exploding two, three, and sometimes four times in the first minutes following the initial explosion," said David Burrows of Penn State University. "First comes a blast of gamma-rays followed by intense pulses of X-rays. The energies involved are much greater than anyone expected." Before these observations - made with NASA's Swift satellite telescope, which specializes in gamma-ray burst detection - scientists believed that star death was a single explosion event. But that view changed once Swift went operational last November and scientists began seeing multi-explosion events. One recent blast, GRB 050502B, is the perfect example of the new description - an initial blast followed by a series of energized "hiccups." On May 2, 2005, Swift detected the event, a 17-second gamma blast that occurred in the constellation Leo. About 500 seconds after this initial blast, Swift detected a spike in X-ray light - the "hiccup" - about a hundred times brighter than anything seen before. Although the scientists operating Swift have seen about a dozen cases of multiple explosions and ejected material, they are not quite sure how it all works. What they do know, though, is that the material grows extremely hot and creates a fireball. The fireball condenses into a bulging dome of material surrounding the black hole and erupts in a narrow jet. "The radiation pressure of the fireball accelerates material to nearly the speed of light," Burrows, leader of the Swift XRT team, told SPACE.com. "Shocks within this jet dissipate energy and create the X-rays and gamma-rays that we see." A newborn black hole is a chaotic object, and this chaos seems to be what drives its creation. "We aren't clear on the details yet, but it appears to be messy," said Peter Meszaros of Penn State and leader of the research group trying to sort this all out. "Matter is falling into the black hole, which releases a great amount of energy. Other matter gets blasted away from the black hole and flies out into the interstellar medium. This is by no means a smooth operation." An animated artist's rendering of the process is available here. Another explanation goes like this: After the initial blast, the jet of material begins to fall back on itself. This creates shock waves in the jet's core, slamming blobs of gas into one another and producing X-ray light. Before the Swift telescope went up, scientists had seen hints of an "X-ray" bump about a minute after the initial GRB and before the final slow burnout known as the afterglow. But they couldn't catch it in time. Now, the Swift telescope automatically detects the first stage of the explosion and targets on the event in about one minute. The findings were detailed last week in the online version of the journal Science.